What Should You Do If You Have a Cracked Tooth? Experiencing sensitivity with sweet as well as hot and cold temperatures. This pain means that liquids or sugars are seeping into the tooth through a crack. Feeling discomfort when you’re chewing or biting down, especially on something hard. Usually, it’s a quick, sharp pain that goes away as soon as you take pressure off the tooth. What’s happening here is that the force being applied to the crack while chewing is causing the tooth to flex. Not being able to pinpoint the source of your pain, but rather experiencing it in a general area of your mouth. Especially if there are no signs of decay or breakage, you may have a crack. Gum tissue that is starting to swell, bleed, or feel sore. Your tooth could have cracked for several different reasons. Perhaps you were hit in the mouth. Or, you bit down on something hard like a piece of bone in your steak. Some people have strong bites; when they close their teeth together, they do it forcefully. This habit is something that you can’t help, but has a tendency of causing cracked and chipped teeth. Also, if you have a deep bite, excess force is being put on your teeth which can cause cracks to develop. If you grind or clench your teeth, you’re also putting yourself at risk for cracked teeth. Finding cracks in teeth can be difficult, because they’re so hard to see at times. A person may complain of the above symptoms and the tooth looks completely healthy. If that’s the case, we may suspect a cracked tooth. It’s important to determine how your cracked tooth and what caused it. If left untreated, the fracture will get bigger and you may end up losing your tooth. We’ll also want to prevent this from happening to other teeth in the future. When diagnosing cracks in your teeth, x-rays may not be very helpful. Cracks won’t show in a radiograph unless they’re fairly large. Our Newport Beach dentist, Dr. Yazdan, has magnification resources that allows us to see up close areas of your teeth. This can help detect smaller cracks. We’ll also use a special instrument to feel if there are any potential fractures anywhere on your tooth. If our dentist suspects a crack but can’t see or feel one, a special bite stick might be used. The purpose of this tool is to mimic the pressure felt when chewing on something hard. You’ll be instructed to bite up and down on the stick with several teeth until we locate the area of your discomfort. Dental dye can also be used to diagnose cracks in teeth. This liquid is placed on your teeth, and if are cracks are present, the dye will have seeped in, revealing them. The type of treatment that will be needed will depend on the type and severity of the crack. Hairline Fractures or “Craze Lines”: These are superficial cracks don’t go past the enamel surface or outer layer of your tooth. As stress fractures that are somewhat common, they don’t cause pain. In this case, Dr. Yazdan may choose to monitor the tooth and step in if the crack advances. If needed, we can buff out the crack and fill the void with a restoration. Moderate Sized Cracks: A moderate crack passes through the enamel and into the inner dentin layer of your tooth. You will likely experience some discomfort when chewing on it. To prevent pain, we can cover the tooth with a crown. This way, chewing pushes down on the crown, rather than the cracked tooth. 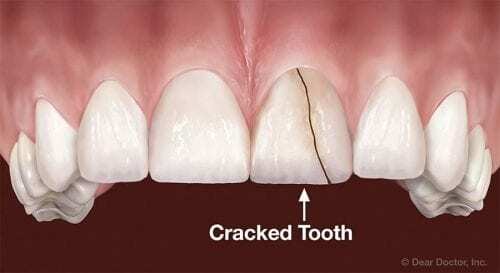 Sometimes a crack is so deep that it has actually split the root of the tooth. In this case, it’s usually more predictable to extract the tooth and replace it with a dental implant. If you suspect you have a cracked tooth, call now to schedule a consultation with our Newport Beach dentist, Dr. Yazdan. 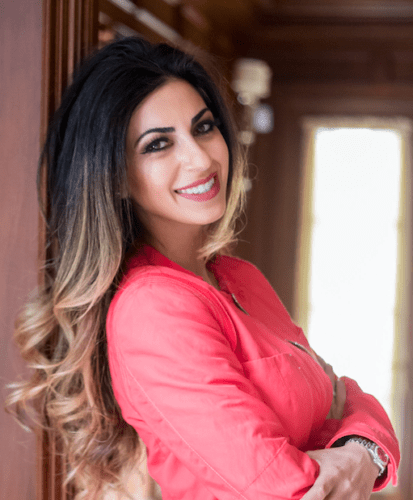 Can You Get a Facelift with Porcelain Veneers?